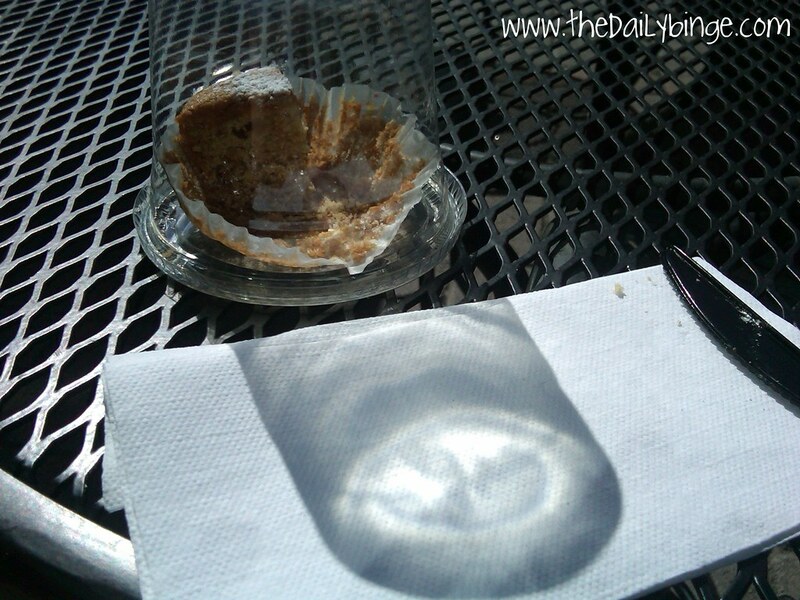 I wasn’t necessarily in the mood to eat a cupcake (shocking, right? ), but I figured as long as I was there I’d scope it out. 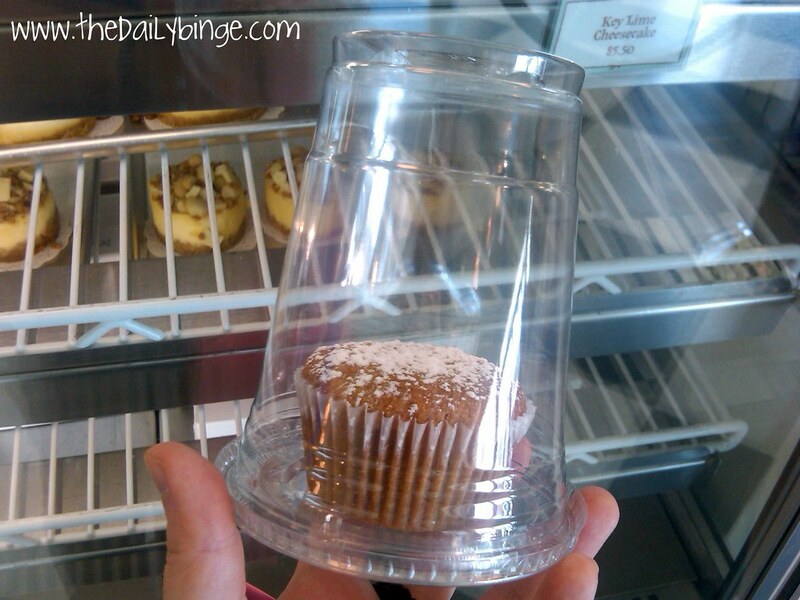 But I didn’t want to buy more than one cupcake, or any red velvet. That’s best eaten in groups. Sorry, sign. I will not be swayed. Besides, Sara had been to Magnolia a few times (she’s more on top of her brows), and had been coached to avoid anything fancy and just get simple vanilla or chocolate. The store itself is fairly simple in layout. There’s a line along a counter where you order and pay, and there’s an area to the side where you actually see people baking and frosting the cupcakes. Oh, but there were cute shirts. I could see my sisters loving these shirts. 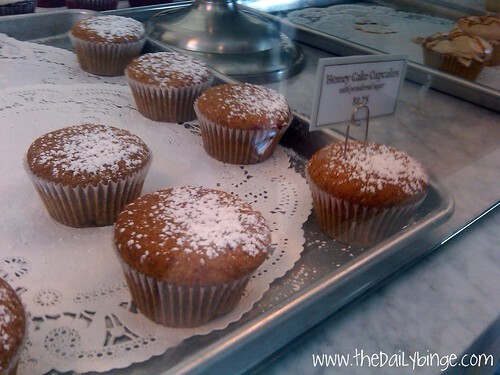 What does it mean, to cupcake something? Is “cupcake” a verb now? Sounds like dirty innuendo. All of the girls working behind the sales counter were wearing aprons and scarves around their heads, which gave them a very Amish/Orthodox Jew feeling. I’m not sure if they were any of those things. 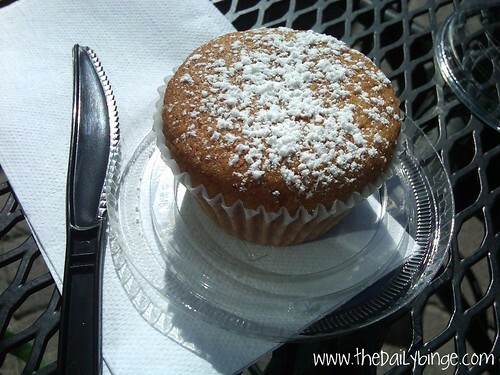 Like I said, I wasn’t really going to order anything, but then I spotted a very simple honey cake cupcake (redundant? ), not even frosted, and thought– oh hey, I didn’t get any Rosh Hashanah honey/spice cake/bread at Hillel. Maybe this honey cake could be my new High Holiday cake obsession. I was quite intrigued by this sign near the cash register. 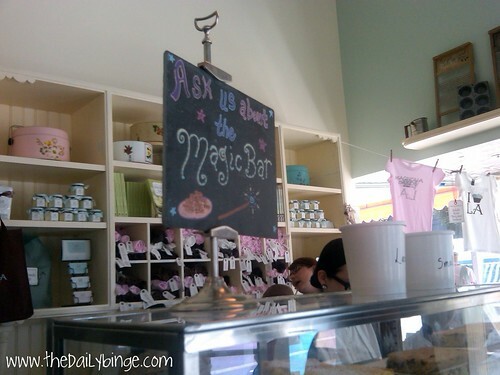 What’s a Magic Bar? Does it involve magic? Does it involve marijuana? I never found out. Oops, I guess that picture had the T-shirts. No need for a separate T-shirt picture. Ah well, double dose of T-shirts. DEAL WITH IT. Since the cupcake was very portable and I wasn’t super hungry and there wasn’t really anywhere to eat, I took it with me on my next errand and ended up eating it in the courtyard of the West Hollywood Gateway (aka the Target, for you locals). 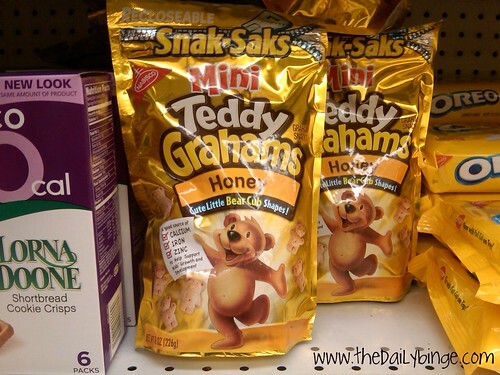 In case you don’t remember Teddy Grahams, this may jog your memory. The packaging was different, when I was a kid. And I think the current bear is a little too in-your-face (with cookie nutrition facts?). Oh the times, they are a-changing. Is a frosting free cupcake even a cupcake? 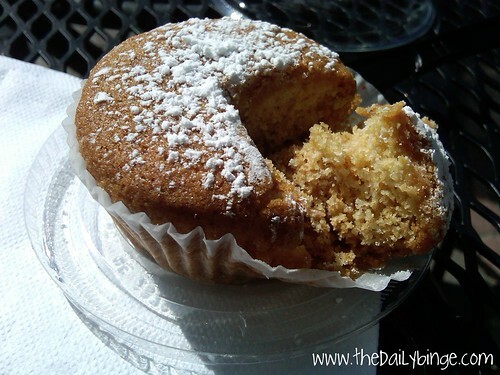 What’s keeping it from being a muffin? I like big shadows and I cannot lie. So… that was Magnolia. I definitely want to try some other flavors, especially with Lauren/Sara/Bea/GIRLZ (sorry Cole, you were great). The more people, the more flavors we can try. Oh, and I STILL need to find a new honey/spice bread/cake. Applications will be accepted year round. I wasn’t too impressed when I went to Magnolia the first time, but now I am OBSESSED with their simple chocolate cupcake with chocolate frosting…de-lish. Also their banana pudding is kind of fabulous, as well as their whoopie cookies that they don’t always have. Oh! 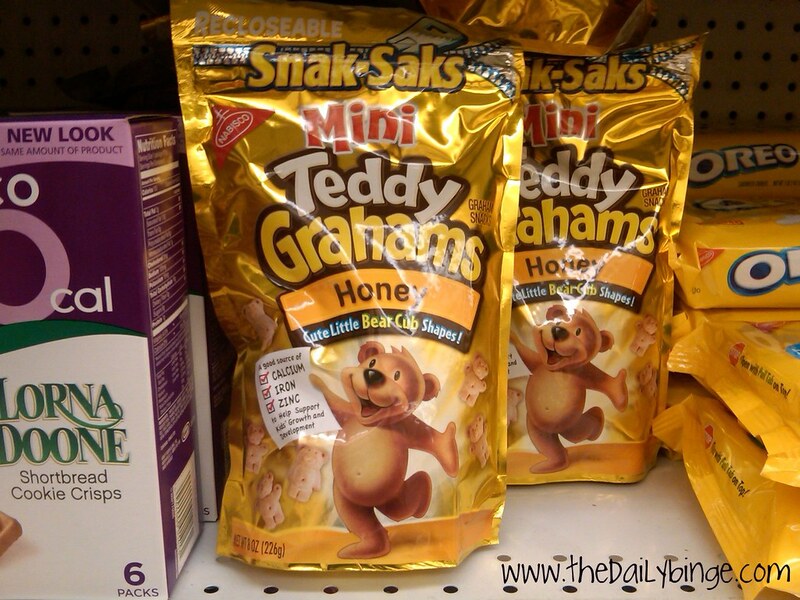 and great blog–I always enjoy staying in touch through your snack adventures! Thanks! We should have a snack adventure one of these days! And I will never judge your visits to Magnolia… you can see that I’m eating crazy desserts far more often than your average bear. Very good to know! I’ve been meaning to try Magnolia, but also don’t believe it could beat Sprinkles. They have the market on MOIST (I hate that word) cupcakes. So moist that when you take a bite, the cake makes whispering noises. 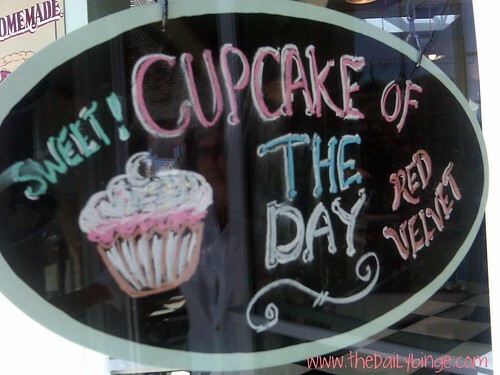 Another place I like is Famous Cupcakes, it’s on Beverly Blvd between Wilshire and Olympic. Oh and the spot on La Cienega isn’t another Sprinkles store; it’s a tiny little walk-up storefront that BH store owns. 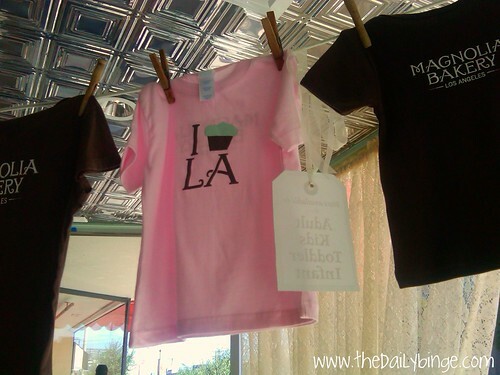 It’s called “The Pantry” and it’s only open during their insanity times of the year (Christmas, Valentine’s Day, etc) and you can preorder your cupcakes and just pick it up on La Cienega to avoid the madness of the wretched BH store. OH, random tidbit of news – the store next to Sprinkles went out of business and they bought the store and plan to make a much bigger and much needed space! Ah! You’re so wise. I also feel icky about the word “moist,” but I can’t think of anything better. I generally try to say “moisture,” as it seems a little less… yeah. We need to invent a new word, here.